Made from high quality and durable chromed Stainless Steel£¬which can be cleaned easily. 360 Degrees fully rotatable solid base with felt anti scratch pad underneath. The capsules can be loaded from the top and removed from the bottom.Great space saver for the kitchen top with easy access to all your capsules. 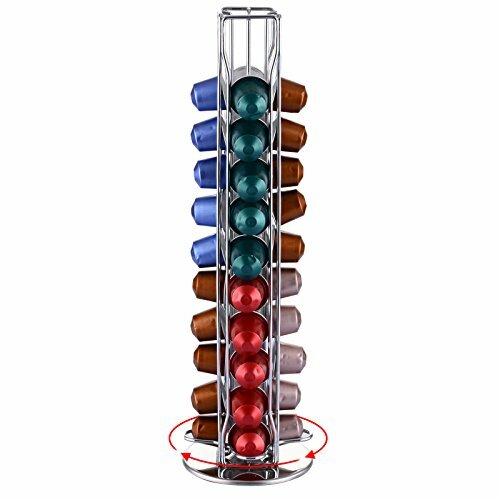 You can sort up to 40 Nespresso capsules in this holder to make a tidy kitchen. If you have any questions about this product by LiNKFOR, contact us by completing and submitting the form below. If you are looking for a specif part number, please include it with your message.